On the eve of four of the most iconic and lucrative days on the Australian turf calendar, two of the country's premier trainers have identified significant issues shadowing the horesracing industry. 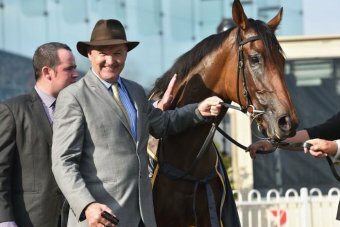 As the $3 million Caulfield Cup looms on Saturday, followed by the Cox Plate ($3m) and Melbourne Cup ($6.2m) in coming weeks, high-profile Sydney trainer Gai Waterhouse claims very few trainers actually make money out of training race horses. David Hayes also worries that the trend towards night racing in Australia poses major risks for stable staff. Waterhouse told ABC NewsRadio's Hoof On the Till that the rising costs of owners and trainers was an issue most stables struggled with, adding that she is forced to subsidise her own training set-up. "Very few trainers are making dollars out of training," she said. "Most of them are eating the paint off the wall, literally - or they're subsidising, as I do my stable. It means I pay, I cough up. I pay an enormous amount each year to keep my stable running." Asked if her invoices to owners met the costs of running her famous Tulloch Lodge at Sydney's Randwick, the champion trainer was blunt: "No, not at all". She said labour costs in Australia are "so incredibly expensive - you know, we're not in America, we're not in Mexico, we're not in India or China; everyone gets a very, very good wage in Australia and going to a Canterbury meeting or a Bendigo meeting, you lose money on it. "You only make money when you're winning the Group 1 races." At the heart of this expense, the trainer said, is the care of the horses. "If you're going to do it correctly, as I do and have the best bedding, have the best care (and) number of people for horses to get walked every morning and exercised, have the ice baths and heater lamps and all the things that can aid the horses' lifespan and productivity on the race track, it costs money." The trainer said she encourages prospective owners to understand they have a choice between owning horses and other 'life luxuries'. "I say to people 'you have a choice of paying dues to a golf club, or have a luxury boat, or you could have a string of racehorses'. "It's all the same. You've got to go into it and say 'look, I'm hoping to have a lot of fun on this ride, but I'm not sure if I'll have a lot of success'. The trainers try their utmost to give the success to the owners, because without success, you can't carry on." Hayes, who won two of the four Group 1 races at Caulfield on Saturday, is just as direct when it comes to night racing. "It's terrific for (betting) turnover, but gee, there's a lot of burnout with the staff," Hayes said. "When they're with a horse at Moonee Valley and getting home at 12 o'clock [midnight], and then back at Flemington at 3:30 the next morning to have runners all day. "It's very hard on the participants." The programming of Australian races is another concern within the industry, and Hayes called on racing's rival states to work together more collaboratively. "I would just love to see New South Wales and Victoria work more in harmony. It's easy to say, but very hard to do, I understand that," he said. "I'd (also) love to see a national TAB. It's easy to say again, but hard to do - otherwise they would have done it."